In 1887 North Carolina Mutual Insurance Company cofounder John Merrick (1859-1919) moved into this Victorian-style home on Fayetteville Street in Sugar Hill, the area of the Hayti neighborhood where well-to-do African Americans lived. Born into slavery in 1859, Merrick began work in the barbershop business as a bootblack. He became one of Durham’s most successful entrepreneurs and eventually owned three white and two black barbershops. In 1898 Merrick, along with his friend Dr. Aaron McDuffie Moore and five other black businessmen, established what would become one of the nation’s largest and most profitable black-owned businesses, North Carolina Mutual Life Insurance Company. Merrick served as its president until his death in 1919. Merrick’s widow lived on in the house for 20 more years, until it was transferred to her daughter, Martha, and Martha’s husband, Dr. Clyde Donnell. After their marriage in 1919, Donnell was made vice-president and medical director of North Carolina Mutual. Donnell also served as vice-president of Mechanics and Farmers Bank, which shared close ties with the Mutual. 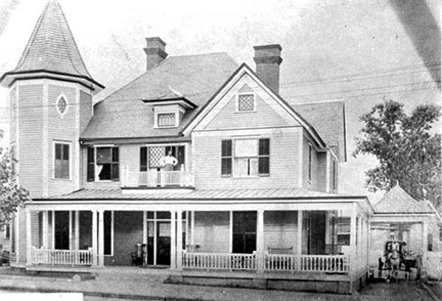 The Donnells lived in the house on Fayetteville Street until the early 1960s, when it was torn down during urban renewal to make way for the Durham Freeway.